Weeks before the first ever Swahili Literary Festival kicks off in Kenya in the first days of March comes news that the 2018 Mabati-Cornell Kiswahili Prize for African Literature will be presented at a special event at the University of Dar es Salaam in Tanzania on Friday. The prize winners…Tanzanian Zainab Alwi Baharoon, for her novel Mungu Hakopeshwi, and Kenyan Jacob Ngumbau Julius, for his poetry collection Moto wa Kifuu (will both) receive $5,000 each. writing in African languages and encouraging translation from, between and into African languages. The winner of the poetry category is published in English translation by the Africa Poetry Book Fund (APBF). Winners in other categories are published in Kiswahili by Mkuki na Nyota Publishers and East African Educational Publishers (EAEP). 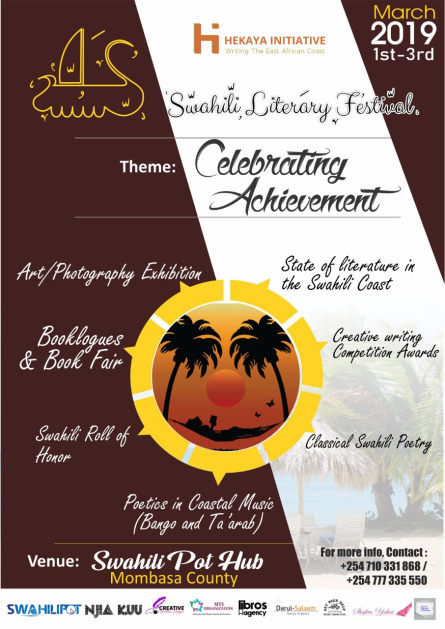 Meanwhile the Swahili Literary Festival in Kenya is set for 1-3 March. Check out this TNPS post to find out more about the problems facing readers and authors wanting Kiswahili content. I’ll end here by quietly noting that, as some have pointed out, the language is called Kiswahili. But the festival is called, by its organisers, the Swahili Literary Festival and they themselves refer to, for example, classical Swahili poetry. I use Swahili as English for Kiswahili in the same way I write French instead of français and Spanish instead of español. No slight against the African languages should be read into this.